SSD Hale went bowling! 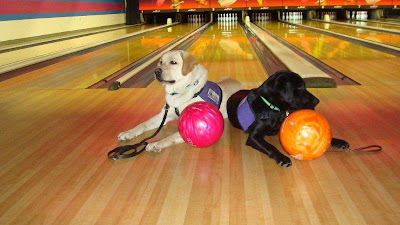 The Northeast Puppy Raising Program took their dogs bowling, a great way for the dogs to get experience with loud noises and balls they aren’t allowed to chase. Hale actually got to go bowling with her sister, SSD Parks! Parks is being raised in the Harrisburg area, but SSD Parks and SSD Fred did a puppy swap. We have our puppy raisers swap puppies a few times a year so that the dogs get used to a new handler and routine, and so our puppy raisers get used to handling a different dog. Hale and Parks really wanted to play together, but their puppy raisers worked hard to keep their attention. Once the two puppies were focused, they let them play together for a little bit. At the bowling alley, Donna spent some time shaping Hale to move the bowling ball with her nose. However, Hale continued to bat at the ball with her paw. Donna recognized that she had clicked Hale for using her paw rather than her nose, and she tried to correct it, but for this particular shaping session, Hale continued to focus on using her paw. Lindsey and Donna took Hale up to the line to bowl a few times. Hale did very well! One of the skills Hale has been working on is going into a bathroom stall. 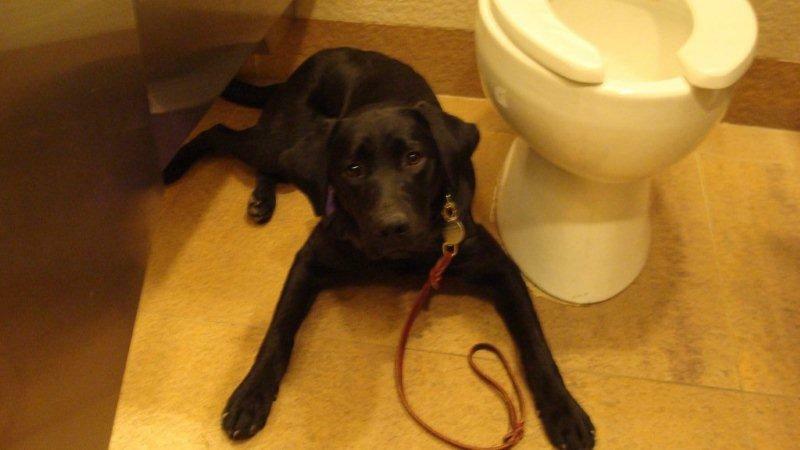 This is actually a very important skill, since the dog will need to accompany their partner into the stall. At first, Hale didn’t want to go in. However, with the assistance of Meg, our volunteer trainer, Susan, another puppy raiser, and Lindsey, Donna was able to figure out how to help Hale be successful. Instead of having her walk forward into the stall and then turn around, Donna asked her to turn around and back into the stall. Bingo! Hale now backs perfectly into the stall every time. She will also back out of the stall, if necessary. Donna has also been working with Hale to get her used to wearing a comfort trainer. Depending on a person’s needs, the dog may need to wear a comfort trainer once they’re placed with their partner as a working service dog. We try to get all of our dogs used to wearing one, and we actually train them to stick their head right into it. Donna has started by getting Hale used to having the loop of the leash over her nose. She wasn’t too keen on it at first, but now she’ll walk around with the end of the leash over her nose. Nice progress! The skill “under” has been a challenging one for Hale. For a while, she was not too happy about tucking herself under tables, chairs and other small spaces. However, she seems to have progressed beyond that. Donna can now target or lure her under a table or chair. She hasn’t added the cue yet, because Hale isn’t quite ready yet, but soon she’ll be tucking herself under on cue. Hale also had an experience with a helicopter. One flew very low overhead, and then turned around and came back. Donna was prepared for the loud noise and strange object to startle Hale, but Hale took it all in stride. She watched the helicopter closely, then turned and looked at Donna! She didn’t try to chase it, bark at it, or cower. Instead, she choose to look at her puppy raiser. Nice job! Hale’s favorite cue seems to be “heel.” She flings herself into position at Donna’s left side, and she always seems so excited to do it. She also loves to play fetch. It’s a great way to burn off some energy in the morning! She has a tug toy that Nikki, one of SSD Rizzo’s puppy raisers, made for her, and she plays with it constantly. In fact, Hale, Nubble, and Gizzy, the family dog, all pull on it at the same time! Hale is one smart puppy, though. Donna and her family use baby gates to block the doorways of two rooms in their house when they don’t want to dogs to go in those rooms, and Donna had stopped securing them between the door jambs. They just prop them up. However, Hale figured out that if the gates are facing inward, she can bump them with her nose to knock them down so she can get into the rooms! Donna has had to change the way she props them up so that they hit the doorway instead of falling down. What do you think Hale will learn next? Although it’s cooler today, SSD Hale has been loving the warm spring weather! She wants to go outside all the time. She spends lots of time watching the robins, but she doesn’t chase them. Hale has also rediscovered how great green grass tastes! She tears off a few blades and tosses them in the air! Donna, Hale’s puppy raiser, is looking forward to the time when the weather warms up enough to set up the doggie pool. Did you see Hale at PawsAbilities? On Saturday, March 10, she spent some time at our puppy raiser booth near the Faulkner Subaru car. She played with the enormous Cane Corso at the neighboring booth, but she spent most of her time relaxed on her blanket, watching the people and dogs go by. On Sunday, March 11, she and Nubble both got to go to PawsAbilities! Donna and Lindsey walked around with the two dogs and had a chance to play some games, and Donna was pleased with how well Hale interacted with strange dogs. Hale played Temptation Tower, a game where handlers try to build the tallest tower of dog treats before time runs out – without the dog eating any of the biscuits! Hale did great. She played with Lindsey, but she spent the whole time watching Donna instead of focusing on the tower of dog biscuits. This past Wednesday, the Northeast Puppy Raising Program went to the Mohegan Sun Casino in Wilkes-Barre, PA. Hale did very well! At first, she and Donna sat in the food court with SSD Fred and SSD Cassie. Fred used to get very excited when he was around Hale, but thanks to the hard work of his puppy raiser, he was able to lie calmly next to Hale. The casino was a great place to practice greetings. People were wonderful about greeting Hale. “Whenever someone asks to pet her, I ask them to stop if she pops up from a sit or a down,” said Donna. “It helps her learn that she can’t bounce around when someone is petting her.” When people asked to pet SSD Cassie after they pet Hale, they would ask, “Does she need to be sitting, too?” Although Cassie is able to stay calm while standing, it’s wonderful that people are so understanding and mindful of the dogs’ training. 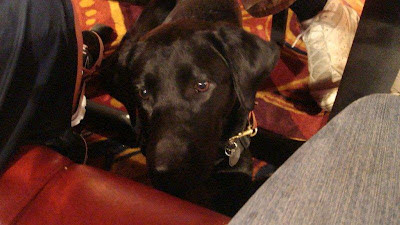 With all of the loud noises and blinking lights, the casino can be a challenging place for a dog. Hale had no problem with it! She did try to eat any gum, so Donna had to be vigilant. After they were finished inside, Donna took the opportunity to have Hale practice walking on a grate. She did very well! 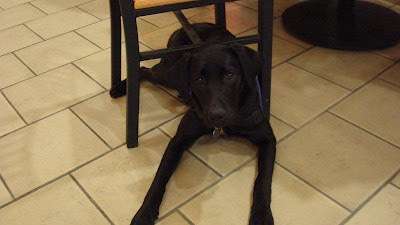 On Thursday, Hale went to Red Robin with her puppy raisers. Donna has been working on “under” with her, and although she doesn’t quite know the cue yet, she is now comfortable going under things and being in smaller spaces. She tucked herself under the table, and stayed there the entire evening. Donna and her family had a very pleasant dinner. When they got up to leave, their waiter was shocked that they had a dog. He had no idea Hale was under the table the entire time, and neither did the people at the surrounding tables. The sentence “I had no idea there was a dog under there!” is one of the highest compliments a puppy raiser can get. It means the dog and the puppy raiser were doing exactly what they should be doing. “I was very proud of Hale that she was so unobtrusive that no one realized it,” said Donna. Hale has also gone bowling, witnessed a low-flying helicopter, and learned some new skills. We’ll have more about her adventures later this week. Everyone knows that dogs and chocolate don’t mix. That doesn’t mean that our service dogs in training can’t go to Chocolate World, though! On Saturday, our puppies in training visited Chocolate World in Hershey. While this is a fun outing, it’s also one of our most challenging outings for our dogs. Our dogs and puppy raisers congregated in the lobby at Chocolate World, and the dogs instantly became an attraction. This was a wonderful opportunity to practice calm greetings. However, walking into a large crowd in a new place can be overwhelming for dogs, and our puppy raisers did great by moving their dog to a quiet corner when they saw them losing their focus. One of the main attractions at Chocolate World is the Great American Chocolate Tour Ride, and we give all of our puppies the opportunity to get on the ride. This is the most challenging part of the outing. The dogs need to walk onto a rotating floor and climb into the car that will take them on the tour. Although some dogs hop right on the ride, some of them need to walk around the rotating floor for a little while before they’re comfortable enough to get on the ride. For others, simply the experience of walking on the rotating floor is enough at this point in their training. Some of our puppy raisers bring their dogs back to Chocolate World later in the dog’s training, and the dog is able to get on the ride. At that point, it’s no longer a new experience for the dog. We loved watching our puppy raisers set their dogs up for success. For example, SSD Quinn’s puppy raisers decided to take the elevator rather than the stairs to get to the tour ride because they knew that the stairs would increase Quinn’s stress level. Once they got on the rotating floor, they approached one of the cars and asked Quinn to get inside. When he didn’t seem to want to get in, they backed away and walked around the rotating floor for a little while. The next time they approached one of the cars, Quinn hopped in. Watch the video of Quinn returning from the tour. Look at how calmly he gets out of the car. He does shake himself, which can be a sign of stress, but he’s not so stressed that he can’t focus on his puppy raiser. After taking the tour, many of our puppy raisers took the dogs through the store. This is also challenging because the dogs need to navigate the crowded aisles and ignore people who reach out to pet them. The dogs did great, and some of our puppy raisers were able to do a little shopping! 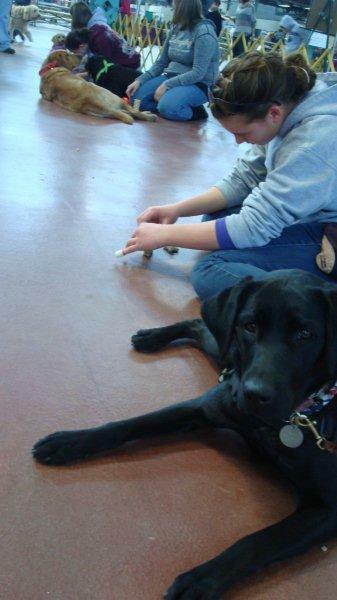 We’re very proud of how well the dogs and their puppy raisers did at Chocolate World! 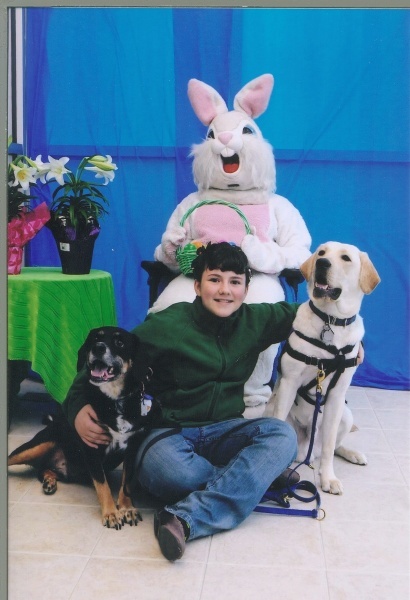 Pet Picture Day with the Easter Bunny! Get your pet's photo taken with the Easter Bunny! Susquehanna Bank is having a Pet Picture Day at their branch off Route 39 in Hummelstown. A professional photographer will be there to take your photo. Pets on leashes and children without pets are welcome. Plus, when you purchase a 4x6 photo of your pet, $5 will be donated to SSD! Each photo costs $10 and can be picked up starting April 3 during normal branch hours. There will be refreshments and giveaways for people and pets! Some local businesses will be there as well, including Nathan Merkel Photography, Pet Value, Red Fern Canines and Fischer's Dog Grooming. 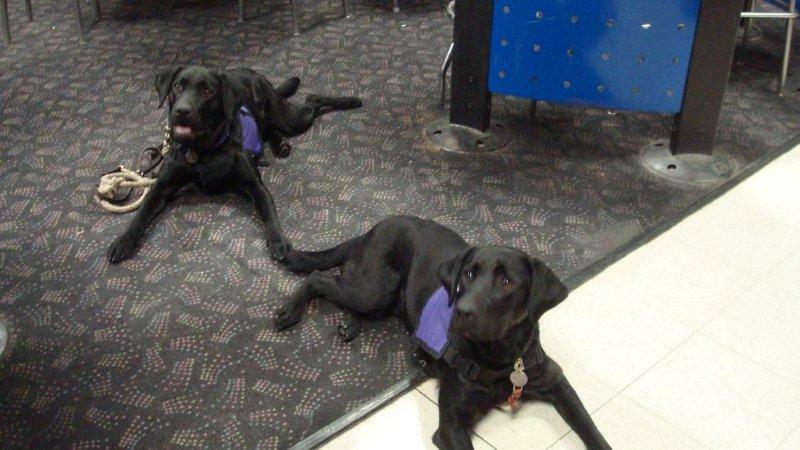 Life happens quickly, and since service dogs accompany their partners almost everywhere, they need to be able to adjust to whatever comes their way. Because of that, service dogs need to have a certain personality to successfully assist their partners. SSD Fred, SSD Lewey and SSD Rummy are at the kennel for their 12-month evaluation. We evaluate all of our dogs when they’re 8 weeks old, 6 months old and 12 months old. We want to make sure that the dogs are well-suited to become service dogs. A dog that gets very stressed being in public would not be able to provide its partner with assistance, nor would it be fair to the dog to continually take it into very stressful situations. We like to make sure that the dogs will be happy and successful working as service dogs. Lewey, Fred and Rummy are taking a temperament test, which lets us see their personality. For this evaluation, we’re not as concerned with the specific skills they’ve learned, so there’s no need for puppy raisers to try to cram in multiple training sessions to make sure their dog does a perfect “heel.” Instead, we’re looking at how the dogs handle different situations, especially situations that may be stressful. The 12-month evaluation helps us determine what direction a dog’s career may take. 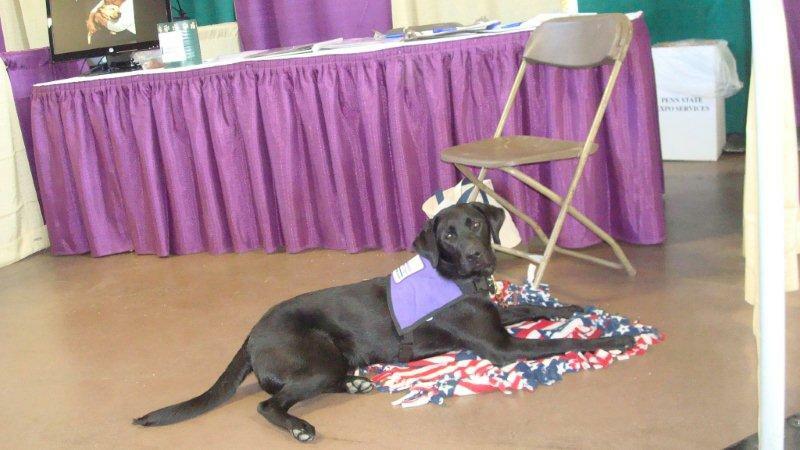 Some dogs may be spayed or neutered so they can continue in their training to become working service dogs. If we think a dog might be a good fit for our breeding program, we will keep the dog intact until they come into advanced training, where we will evaluate them as a potential breeding dog. Dogs may also be moved into the companion dog program, where they will become a pet that is trained in specific tasks to assist a child or other family member. If we find that a dog is not going to be happy and successful doing service dog work, we may discharge them from the SSD program. Discharged dogs sometimes find new careers. SSD Hawk left our program to join the Bureau of Alcohol, Tobacco, Firearms and Explosives (ATF), and he now works as an explosive detection dog in Jordan. SSD Sunshine also joined the ATF, and we have had several dogs become explosive detection dogs with the UN. After the 12-month evaluation, we give our puppy raisers a copy of the information we collected in the evaluation, as well as some ideas for how they can continue to work with their dog to help them succeed. 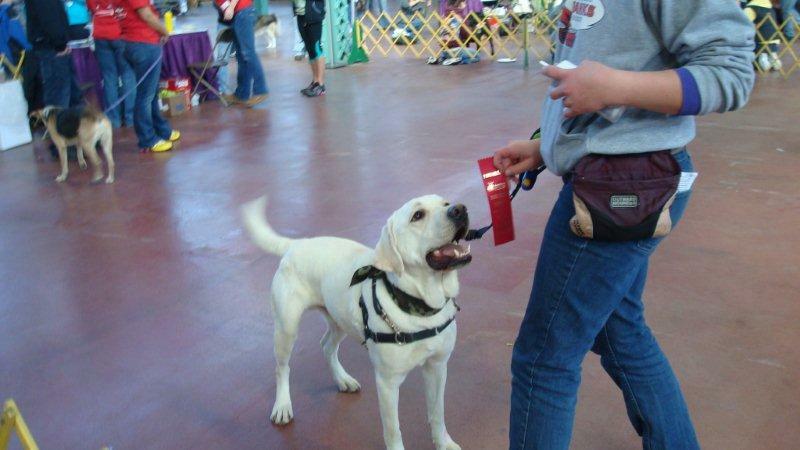 We love to see our dogs succeed, whether they continue in our program to become service dogs, join another organization to find a new career that suits their skills, or become beloved pets. We didn't know there were so many canine Olympians out there! Did your dog compete in the Dog Olympic Games at PawsAbilities? It's the Great Biscuit Bite Off at PawsAbilities! Thank you to everyone who came to PawsAbilities this weekend! We hope you and your dog had a wonderful time. We certainly had fun! Since so much was going on at PawsAbilities, we're going to do a series of blog posts full of photos and videos from the weekend. First up is the Great Biscuit Bite Off! This homemade dog treat competition was judged by service dogs in training. We had seven entries this year. Our first canine judge was SSD Harriet. However, even though she's only one year old, her service dog training is very solid. 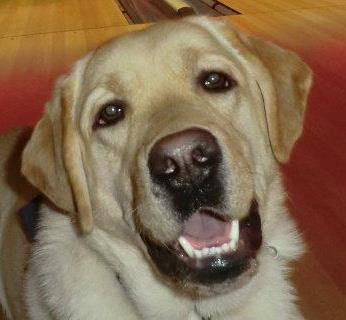 All of our service dogs are trained that they are not allowed to eat anything off of the floor. Despite the encouragement by her puppy raisers, Harriet was convinced that she was not supposed to eat the treats. We decided that SSD Midge, Harriet's mother, would be the first judge, and maybe Harriet would decide to eat the treats once she saw another dog doing it. Watch the video of SSD Midge judging the contest. See how she's spun around so that she had to choose a new treat every time. After Midge tasted all of the biscuits, we gave Harriet another opportunity. Watch her in the video. Look at how solid her service dog training is! Since Harriet continued to focus on her puppy raiser instead of the treats, we brought SSD Rossi to the stage to finish judging the semi finals. The top four biscuits moved on to the finals. We brought SSD Buster and SSD Fire to be our judges. Buster is only four months old, and this was his first time judging, but watch how quickly he catches on! SSD Fire is one of our veteran judges. Look at how excited he gets because he knows what's coming! Congratulations to the winners of the Great Biscuit Bite Off! 1st place: Chicken & Cheese Biscuits by Maryann G.
2nd place: Sam & Jarah's Bark for More Biscuits by Nancy V.
4th place: Pumpkin Oatmeal Cookies by Carrie S.
We'll have more PawsAbilities photos tomorrow! A big thank you goes out to our amazing volunteers. Without you, PawsAbilities would not have been possible. Thank you to our sponsors: Faulkner Subaru, Capital Blue Cross, The Phillips Group and WINK 104! And thank you to all of our staff for working so hard to make PawsAbilities a success. We hope to see you and your dog at next year's PawsAbilities! 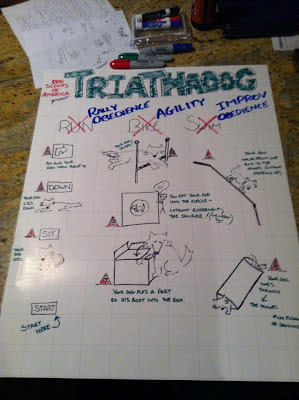 Is Your Dog a Triathlete? Did you know that your dog could be a triathlete? No, he won't have to swim, run and bike. 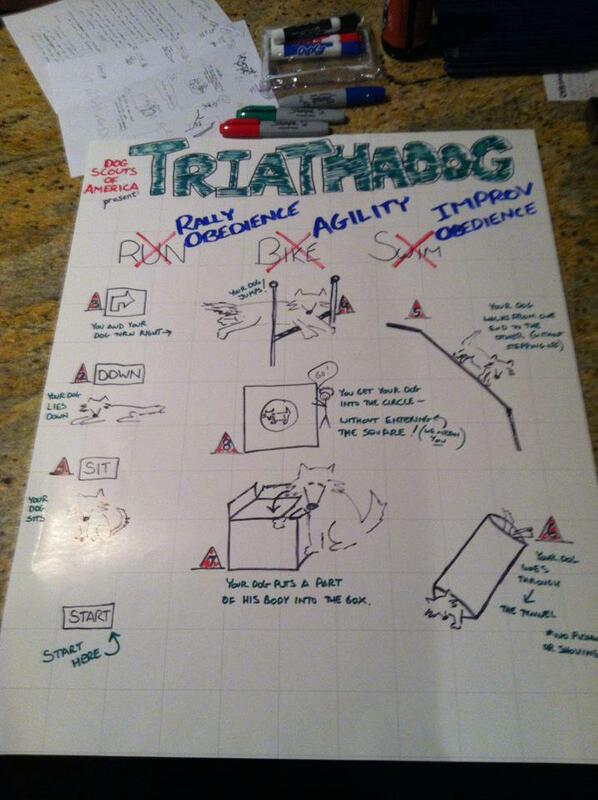 The Dog Scouts of America have created the Triathadog, a game that will test your dog's obedience and agility. The Triathadog starts out with a little bit of Rally Obedience. After completing that section, dogs and handlers move on to agility and then finally, improv obedience! Don't worry if your dog has little or no experience with these categories. It's designed to be fun for all dogs! We hope to see you and your canine triathlete at PawsAbilities this weekend! The fun starts at 9 a.m. at the Farm Show Complex in Harrisburg, PA.
PawsAbilities is almost here! We're ready for the big weekend. Are you? Is your dog an Olympian? The Dog Olympic Games are one of the most popular events at PawsAbilities. Check out the list of games you and your dog can compete in! And don't forget about the Kody Kup Walk! 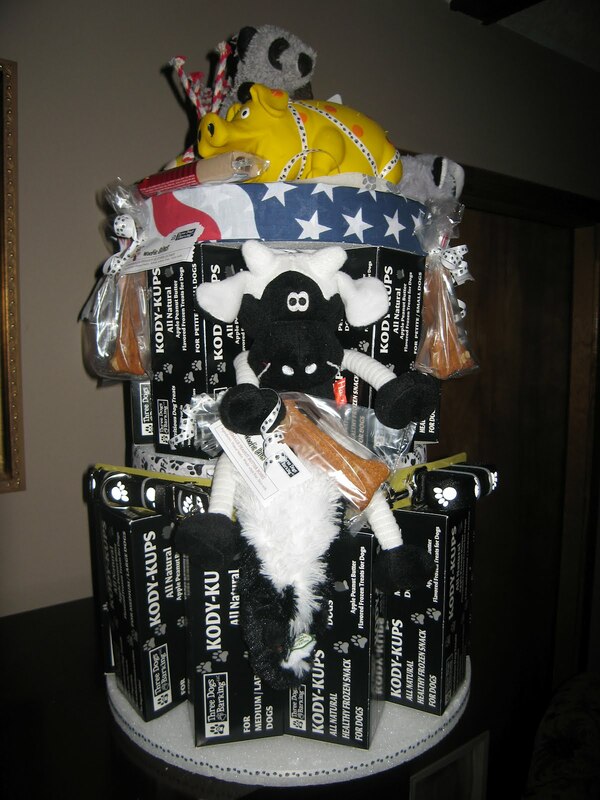 Enter this canine-style cake walk for a chance to win a grand prize donated by Three Dogs Barking, the creators of Kody Kups! Based on last year's amazing prize, this event is a must! Tickets are available at the door, $10 for adults, $5 for kids ages 4-12. Dogs are free! Your ticket is good for the whole weekend. We hope to see you and your dog at the Farm Show Complex on Saturday and Sunday! Teach Your Dog New Tricks at PawsAbilities! Most dogs know how to sit, stay and fetch a ball. But wouldn't it be fun if your dog had a few other tricks up his sleeve? Imagine how impressed your family and friends would be if they saw your dog walking on his hind legs, doing a hand stand or covering his eyes with his paw. At PawsAbilities, you'll have the chance to learn how to teach your dog some impressive new tricks! Bridget McAlister is a freestyle champion and a certified trick dog instructor, and she's coming to PawsAbilities to teach a class on how to teach your dog tricks. Using positive training methods, you and your dog will have fun and bond over learning new things. Learning dog tricks may open a whole new sport for you and your dog. You could even go on to earn a Trick Dog title! Bridget is also a freestyle champion, and you'll be able to watch her and her dogs perform a freestyle dancing routine! PawsAbilities is on March 10-11 from 9 a.m. to 4 p.m. at the Farm Show Complex in Harrisburg, PA. Learn more and buy your tickets!